The US company Aldus Corporation was founded in February 1984 in Seattle, Washington, by Paul Brainerd (b. 1947). Brainerd has a graduate degree in journalism at the University of Minnesota and worked at the Minneapolis newspaper Star and Tribune. 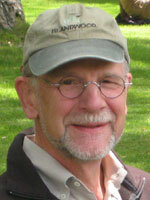 In 1980 he joined Atex in Redmond, Washington, a company that sold computer-assisted publishing equipment to the newspaper industry. In 1983, the plant was closed, thus Brainerd and five other Atex engineers decided to stay in the Pacific Northwest and start up their own company. Brainerd and his partners decided to name their company Aldus, after Aldus Pius Manutius (Teobaldo Mannucci) (1449–1515), a famous fifteenth-century Venetian pioneer in publishing, known for standardizing the rules of punctuation and also presenting several typefaces, including the first italic. Manutius went on to found the first modern publishing house, the Aldine Press. The flagship program of Aldus Co—PageMaker was released in July 1985. This groundbreaking program was the first ever desktop publishing application and revolutionized the use of personal computers, virtually creating the desktop publishing industry. The term desktop publishing was itself coined by Brainerd. 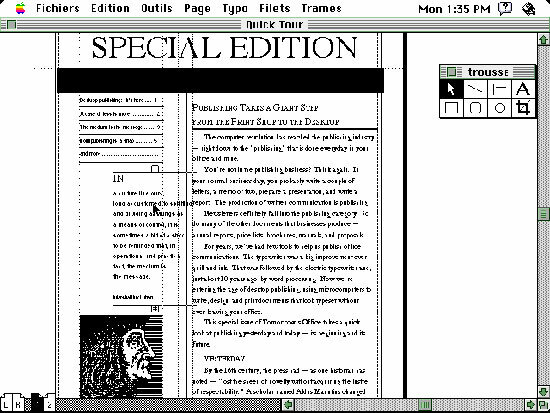 PageMaker relied on a graphical user interface, and was initially for the then new Apple Macintosh, in 1987 for PCs running the then new Windows 1.0. PageMaker relies on Adobe Systems' PostScript page description language. Suddenly anyone could design brochures. Publishers had to become computer literate, and Apple started selling Macs and LaserWriters in large numbers. Aldus helped Apple to market its hardware to customers who wanted desktop publishing capabilities. In return, Apple featured Aldus's software in much of its advertising, and also helped the fledgling company distribute its program. Retailed for $495 PageMaker 1.0 (see the upper screenshot) included all the basic elements needed to lay out pages: free form drag and drop positioning of page elements, sophisticated type tools, a well-chosen selection of drawing tools, the ability to import text and graphics (most importantly, EPS files) from other applications, and the ability to print to high resolution PostScript printers with WYSIWYG accuracy. The users could easily create professional-quality books, newspapers, newsletters, brochures, pamphlets, and other graphic products. PageMaker not only made desktop publishing possible, it spawned entire cottage industries for clip art, fonts, service bureau output and scanning, and specialty products for laser printing such as foil overlays. Aldus succeeded to make the PageMaker program accessible to all kinds of computers and operating systems, signing agreements with Hewlett-Packard, Microsoft Corporation, IBM, Wang Laboratories and Digital Equipment. Then it decided to offer its program to computer users outside the United States, establishing itself as Europe's leading producer of desktop publishing software by the spring of 1988. Controlling nearly half of the British, French, and German markets for these products, PageMaker was the world's fourth most popular software program. Despite the popularity of the PageMaker, Aldus's status as a single-product company caused some concern among management and investors. The company needed to move beyond PageMaker to other products and functions in order to continue its rapid growth and remain profitable. Thus in 1987 Aldus introduced FreeHand, a raster graphics drawing program, and SnapShot, an instant electronic photography software package for use on personal computers. Later Aldus presented SuperPaint, Personal Press, Digital Darkroom, PhotoStyler, PressWise and PageAhead. In January 1988, sales of the PageMaker program topped 200000, with 90000 copies of the program shipped in the preceding year. That spring, Aldus introduced updated versions of PageMaker for use on the Macintosh and on IBM-compatible PCs. With this advance, Aldus maintained its dominant grip on the desktop publishing market. PageMaker continued to evolve, reaching new heights with its 1992 version 4.2, which had such essential features as text rotation and a story editor. Despite some interesting marketing ploys however Aldus had lost significant market share to the rival QuarkXPress, which had some powerful features, such as color separation, which PageMaker then lacked. Later QuarkXPress continued to gain market share, due largely to ignorance and mythology regarding PageMaker's capabilities. Most people who used both programs preferred PageMaker, but that didn't seem to help Aldus, and their dwindling revenues eventually led to their acquisition in 1995 by Adobe, which re-introduced PageMaker as Adobe PageMaker and subsequently updated it to version 6, 6.5, and finally 7 in 2001. Then, Adobe rebranded the next version of PageMaker to Adobe InDesign. InDesign was developed in Seattle by the PageMaker product team.